[SMALL Sized BIG SOUND]: Compact & lightweight design, only weighs 1.67 oz, this mini Bluetooth speaker is super portable for you to enjoy the music anywhere you want. The 3W rate power and enhanced bass resonator offer you crystal clear and incredible sound quality. [SUPER PORTABLE]: This speaker measures only 1.7" x 1.4" (WxH) that it fits neatly into any pocket or handbag, perfect for going out. With the strap, you could hang it to your bag when you go hiking or climbing the mountains. Up to 4 hours of playing time. [UNIQUE DESIGN]: Unique ABS body covered with sleek aluminum-alloy shell and silicone base make the speaker elegant and modern. We added a full rounded anti-slip base on the bottom of this small speaker. 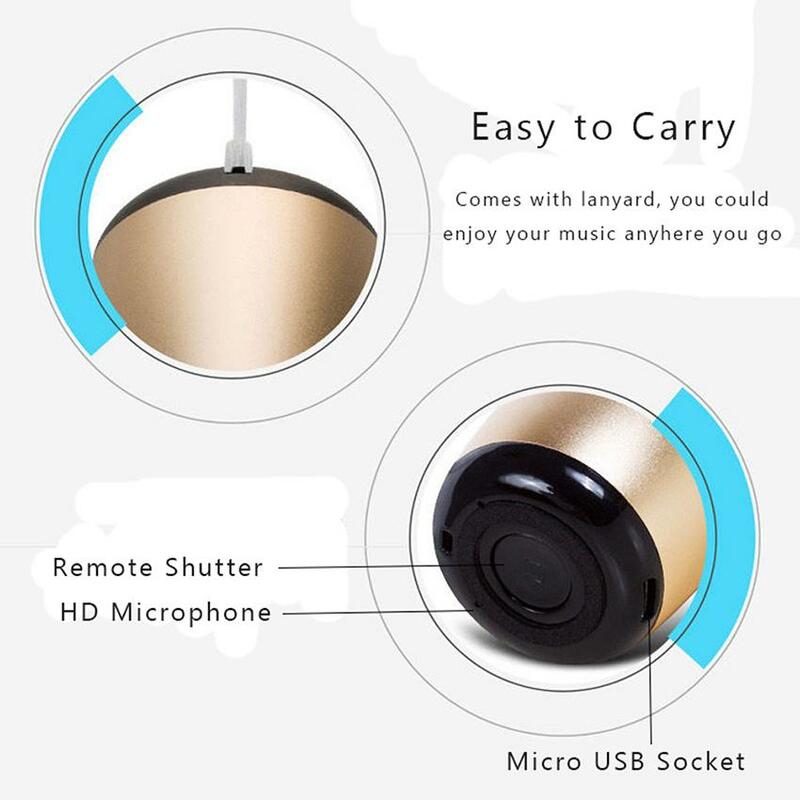 [MULTI-FUNCTION]: This mini speaker is very easy for us, just one simple click, you could answer the phone call, take a selfie and play the music. [ADVANCED TECHNOLOGY]: Upgraded Bluetooth 4.0 version, compatible with most smartphone, tablet, laptop. Ideal for a cafe, Mini-bar, small party, car, outdoor activities, picnic, and many other situations. Compatible with iPod, iPhone, and iPad.